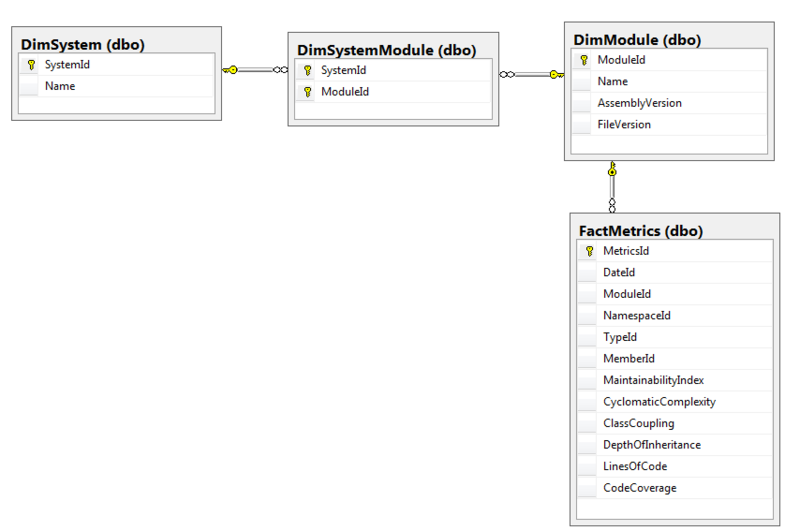 As I mentioned way back LINQ SelectMany() has very helpful overload parameter to project items. This comes handy in cases with complex many-to-many schemas where you want LINQ query to be as close to hand written as possible, and as a matter of fact, it turns out to be pretty close. In other words, on object level System and Module are many-to-many and Module with Metrics are many-to-many as well. Here's what is going on here. In the first SelectMany() we ask to flatten Modules which are in Systems. However we don't want to loose our System data since we need SystemId and Name, and this is where projection overload comes in. In (s, d) => ... we ask the output of SelectMany to carry over all System properties plus collection of Metrics, which we need next. Second SelectMany() does similar thing. It flattens MetricsList and passes it on along with Systems from the first step. Finally, Where and Select do final restriction and projection. Roughly speaking each SelectMany corresponds to TSQL JOIN and the rest of the query follows typical LINQ statement format. Two other choices of writing the same query that I can think of are LINQ Join and Any. Would it be more efficient and concise? Maybe, but I doubt.